Decorating for the Holidays is a little bit more special for me this year. Both sides of our family will be here for Christmas... or at least sometime around Christmas to meet the baby. So, I want our house to feel like the Holidays when everyone (including the baby) arrives. My theme this year is a 'Handstitched' Holiday. I've never had a theme for my Christmas decorating, but when I was looking for material for the stockings I found a blanket that looked like a knitted sweater. It had exactly the look I was going for - cozy and classic. From the blanket I made a pillow and stockings. It also inspired my gingerbread cookies. Stay tuned for the next week to see more details and step-by-step instructions for created your own 'handstiched' holiday. We drove up to Vermont last weekend to get our Christmas Tree, a Frasier Fur. Last year we had a fresh Frasier Fur in Kansas City that was shipped in - this year we got our own directly from the farm! I'll post photos from our trip next week. I love that the stockings look like they were knitted... even though they were cut from a knitted blanket and sewn together. Here is a close up of the knitted blanket that became my stockings and pillow. I'll post the DIY directions later this week. I potted paperwhites... they should be in bloom by Christmas! On the mantle, I perched a faux bird amongst the cedar sprigs... it drives Mr. Darcy crazy! I think he can smell the feathers. 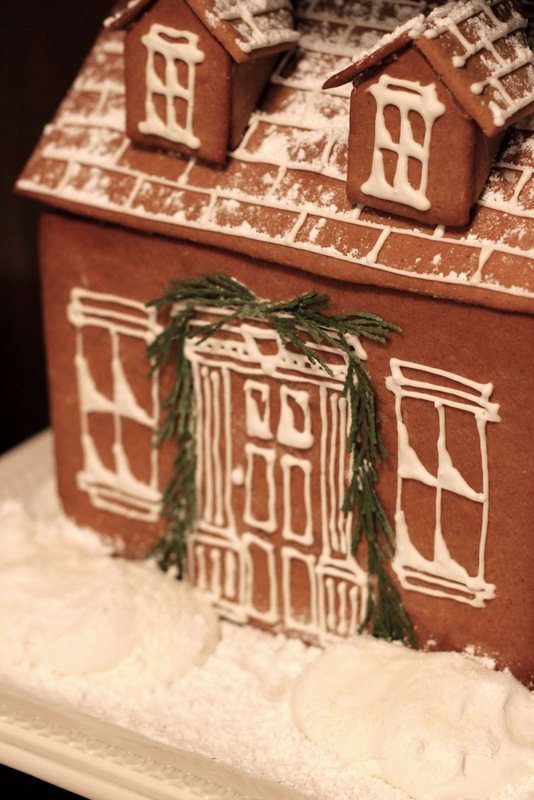 This was my first attempt at making a gingerbread house - it was harder than I thought it would be, but a lot of fun. I "handstitched" these gingerbread cookies to look like the knit blanket. Stay tuned for decorating how-to! 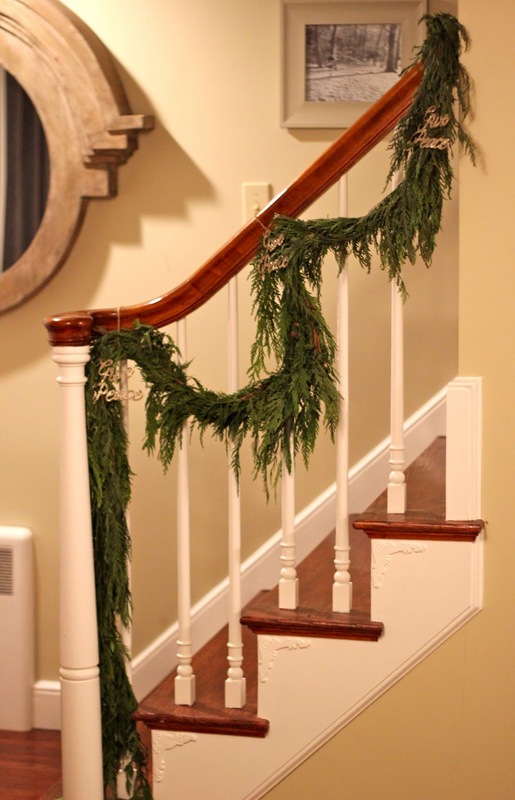 Fresh cedar draped on our banister - I only use fresh garland and wreaths in our house. It makes the holidays feel more special with 'real' decorations. Our packages even have a 'hand-stitched' feeling with yarn, cotton ribbon and stitched burlap. Your home looks gorgeous for Christmas! I have always wanted to decorate with real garlands--but I had heard that you had to spray them down with water each day. Is that true? If so that would be damaging to my wood furniture, mantel etc. What do you do? Thank you! ps your site will not allow me to leave a comment with my google account. Wierd! I have the same question: how do you keep the evergreens fresh? 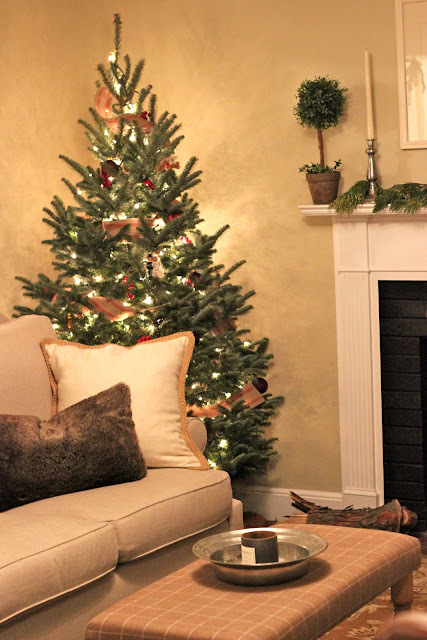 My live Christmas tree gulps water like crazy so I can only imagine a garland would do the same, especially if it's near the fireplace! I love to decorate for Chirstmas, it entertains me to think the new things I can buy and use to give some color to the house. Last year I spent it in Argentina because I decided to do something new. I had gotten several apartments in Buenos Aires and I decided to decorate the one I was staying in that night. The owner liked it so much she asked me to go to other places and do the same! I found your blog through a pinterest board from Mrs french, where your project for hand painted linen towels was pinned on the diy board, and I have thoroughly enjoyed looking at all your lovely holiday projects.Hope to pop in more often!